Sad news – we have just learned that Dorothy Woodhead died in hospital on 15th October. Everyone associated with Overgate Hospice Choir sends their condolences to her family and friends. Her funeral service will be held at Park Wood on Wednesday 1st November at 12 noon. There is a gathering at The Maypole at Warley after the service. Please let Carol know if you will be joining Dorothy’s family at The Maypole, for catering purposes. Dorothy was a great stalwart of the choir and tried in every possible way she could think of to raise funds and sponsorship. It was all down to her that we were awarded the 1st prize from Grand Central. 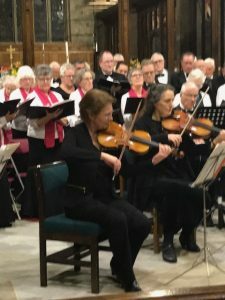 Thanks so very much for your great singing at the most recent concert and for a terrific attention to musical detail throughout – it was all most impressive and the audience members were thrilled by it. 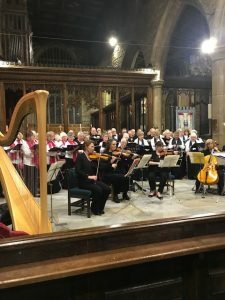 As I had promised, the orchestra brought so much wonderful warmth and colour to the musical timbres – not least to the John Rutter editions of the two Fauré works that hold so special affection in the hearts of all involved with them: the Cantique de Jean Racine and the evergreen Requiem. 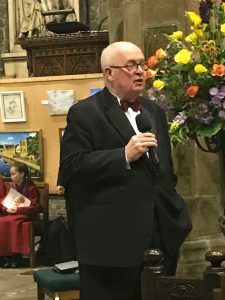 Our grateful thanks go, too, to organist Alan for his entirely magnificent contributions throughout and to Angelina Warburton for her glorious harp playing. Special gratitude goes, as usual. 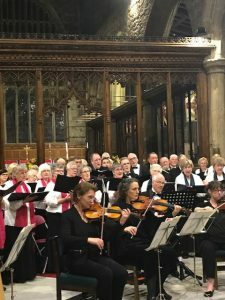 to Sally Robinson for her leadership, for the wonderfully silken enhancements to the Sanctus and In Paradisum in the Requiem and for bringing such terrific talent with her to grace our endeavours! 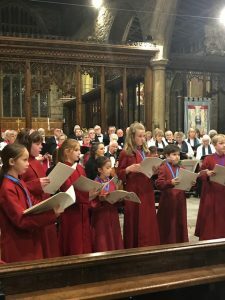 The Minster Choristers made a magnificent contribution in Pie Jesu and Quentin Brown’s rich baritone enhanced two further movements – the Offertoire and the Libera me. Now on to the Carol Cavalcade soonest. We will be singing carols under the Christmas Tree in The Piece Hall from 1.00pm to 2.00pm. This is a fundraiser for the Hospice so please do come if you can. We will be taking part in the Light up a Life service at 4.00pm in the garden at Overgate. The families who have lost loved ones at the Hospice take great comfort from these services. The choir has been involved in the last few years. Please sign up on the lists at rehearsal if you can support either or both of these events. Many thanks. We are using the following “press release” to publicise the “Come sing” session on 18th October. Do spread the word to singers you know who might be interested in joining us. Overgate Hospice Choir hosts a special “Come sing” evening with acclaimed voice coach and internationally renowned mezzo-soprano Margaret McDonald on Wednesday 18 October at the choir’s regular rehearsal base, St Jude’s Hall, Free School Lane, Halifax. Admission is free of charge. Please arrive at 7.30 pm for a prompt start at 7.45. The evening concludes at 9.30 pm. Have you a “hidden” voice that just needs to be released? 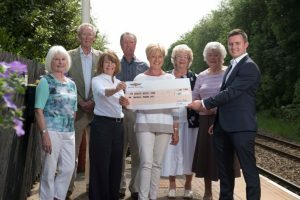 The members of Overgate Hospice Choir with Maggie’s expert help will assist you to find it! Margaret McDonald, mezzo-soprano, is a renowned international singer and voice-coach. She sings regularly in major venues and cathedrals in the U.K. and abroad. She works with many leading conductors, encompassing an extensive repertoire of oratorio and concert work, opera, contemporary and light music. She has recorded a variety of works for Nimbus, Marco Polo and the BBC, including Maxwell Davies’ The Jacobite Rising and Sea Elegy. Maggie now combines a busy singing schedule with her Vocal Consultancy work, being in demand for master classes, workshops and examining. She has taught at the LCoM, RCS and RNCM, where she indeed studied. She is vocal coach for the Hallé Choir, Sheffield Philharmonic Chorus, and has taken workshops for Bury, Ramsbottom, Saddleworth, Doncaster and Huddersfield Choral Societies, the RLPC, BFCS, Barnby Singers and St George’s Singers Poynton as well as male voice and gospel choirs. She is now teaching at Chetham’s School of Music and has directed their opera productions for a number of years. 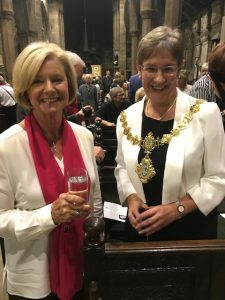 Maggie recently accepted the post of External Examiner for Postgraduate Vocal Studies at Leeds College of Music and is Vice-President of Doncaster Choral Society. Her concert work has ranged dramatically from Mahler’s Third Symphony in Huddersfield Town Hall to the Good Old Days at the City Varieties, Leeds! In recent years she sang Elgar’s The Music Makers and Rachmaninov’s Vespers with the Hallé Choir, in the previous year sang Child of our Time with the Sheffield Philharmonic Chorus, recorded a CD with the Fairey Brass Band, sung a specially commissioned piece by Phillip Lawrence in Liverpool Philharmonic Hall, as part of the City of Culture Celebrations, performed the World Premiere of Equiano’s Lament by Borthwick and performed with the Manchester Camerata in the Leeds International Concert Season. In 2008 she sang the Sheffield United Football Club Anthem in Bramhall Lane Stadium for a documentary about the club, and before the final match of the season in front of 30,000 fans! Recent concerts have included Elgar’s The Dream of Gerontius in Ripon Cathedral, Rutter’s Feel The Spirit in Saddleworth, Mahler’s 2nd Symphony, Sea Pictures and Beethoven 9 in Chester Cathedral, Bach’s B Minor Mass in London, Brahm’s Alto Rhapsody and Elgar’s The Music Makers in Portsmouth, world premieres of pieces by Alfred Tubb and Jan Swynnoe, Verdi’s Requiem in Matlock, Szymanovski’s Stabat Mater in the Bridgewater Hall and Lichfield Cathedral with Chetham’s Symphony Orchestra and Chorus, plus opera galas and recitals with Leeds-based organist Simon Lindley [City Organist Emeritus] in Leeds Town Hall and throughout the North. 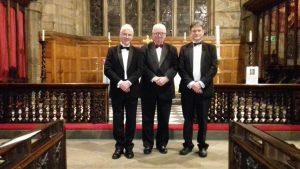 Future work includes world premiers of song cycles by Mervyn Burtch and Luke Whitlock for voice and recorder with John Turner; Elgar’s The Music Makers, The Apostles and Sea Pictures, Beethoven Mass in C, Handel’s Messiah and Verdi’s Requiem amongst recitals, workshops and masterclasses. Even with a busy schedule she still finds time for her hobbies of swimming, yoga and driving fast cars!